We know that the law is good if one uses it properly (1 Timothy 1:8). The moral commandments of Scripture must be the standard for normative ethics. Biblical ethics are proscriptive (what one ought not to do) as well as prescriptive (what one ought to do) of normative human conduct, and should be the ground for our rule of law: deontological. Deontological is obligatory inasmuch as it is the moral will of God in real-life situations: explicit actions that are based on its broad principals. Thus all persons are obligated to affirm and embrace the commandments of God in establishing laws and in living their lives. 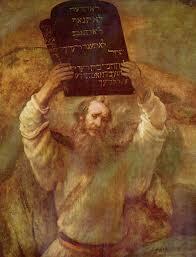 · Old Testament (613 laws/commandments) New Testament (1050 laws/commandments). · Ten Commandments (The Decalogue). · Love God and Love your neighbor. · Sermon on the Mount Matt. Chapters 5-7. And if by grace, then it is no longer of works; otherwise grace is no longer grace. But if it is of works, it is no longer grace; otherwise work is no longer work (Romans 11:6). III. Assist in the sanctification of Christians. Morality may keep you out of jail, but it takes the blood of Jesus Christ to keep you out of hell (Spurgeon). The Gospel has attained and acquired for all Christians, without any works or merit on our part, the forgiveness of sins and the imputed righteousness of Christ that avails before God and provides eternal life. The law is written on our hearts and the Gospel comes from outside us from God’s grace (Galatians 3:10-12). Scripture tells us the law is everything that demands perfect obedience to God and pronounces God’s curses on all transgressors (Romans 3:19). The law of God renders all the world guilty before God’s holiness and reveals the knowledge of sin (Romans 3:20-23). How can one avoid Hell? Jesus taught that it is very simple, “Be perfect as your Heavenly Father is perfect” (Matthew 5:48). Do that every day and live. Recall what Jesus said, “It is harder for a rich man to enter the kingdom of heaven than a camel to go through an eye of a needle.” In that particular instance the disciples were very perplexed. They said, “Lord who then can be saved?” Jesus responded by revealing to them, “With man it is impossible, but with God all things are possible.” Heaven is infinitely beyond the reach of sinful men. Men need God to do the impossible. And God has accomplished this through Christ and His vicarious death and resurrection. It is all solely by grace. Deny Christ and it is impossible for an imperfect man to be accepted into a perfect heaven. One must have their imperfections and sins removed by the cross of God’s Son. The nontheistic worldview not only commits epistemic irresponsibility, it brings despair that grows in its claimants. The unbeliever Byron screams in horror on his death bed as he hollers in delusion that his bedspread is on fire. Voltaire rants and raves about being cursed and forsaken and damned for his rejection of Christ during his last days. We have been spared the horrible last words of the bombastic atheist Madalyn Murray O’Hair when her atheist partner murdered her and her atheistic grandchildren for some cash. Yet her final utterances must have been filled with anguish. A man in London heard a lecture on anti-theism and socialism. He went home and wrote that the Bible was the greatest possible deception. Then he shot himself. Without God, His love and law, man has no purpose and it’s easy for him to fall into depression and despair. This leads to horror in death and eternity. The grace of God freely gives peace to believers and salvation freely given to the sinner (Romans 1:16-17, 10:15; Acts 20:24; Ephesians 1:13, 6:15). The law is distinct from grace but not separate, there is a unity within the diversity. Distinct but not separate. Both the law and grace are in the whole of Scripture. The two pertain to men and women and must be taught side by side with distinction within the oneness of Scripture. Christians are to uphold the law with zeal and with truth through the grace and the power of the Holy Spirit. Some contemporary Christians believe the law is not to be upheld. They argue that we do not need to obey the commandments in today’s dispensation. These are antinomians. Anti means: against. The definition of noumos: Law. Hence an antinomian is against the law. If there is no moral law, there can be no hell and no punishment for lawbreakers. If the law is gone, you get rid of the absolute standards of right and wrong. You also get rid of hell, and you get rid of the need of the Savior too. If we are not lawbreakers we do not need to be saved. 1. Admit that the flesh is weak (Matt 26:41). 2. Repent. Turn from your sin and error. 3. Pray for power and wisdom to overcome temptation and sin. 4. Avoid instruments, places, people, and circles that tempt you and where you previously fell. (1 Corinthians 15:56; Hebrews 12:1-2). The church of Jesus Christ has plenty of programs, plenty of buildings, books, and trinkets. But what we need most are trained, mounted troops of God. Soldiers trained for sudden, daily charges against the gapping breaches in the enemy’s line opened daily by the Word of God. The church has advanced through slow, pounding bombardments as it has opened hospitals, orphanages, outreaches, and care centers. We must become loving troops: enthusiastic, compassionate, and merciful. Exalting the person of Christ our Prophet, Priest, and King should be our passion. He is the unstoppable juggernaut of the church. Christians must become impassioned disciples to run with Jesus. Our moral duty is to put off all the excuses, indifference, sloppiness, slothfulness, slouchiness, laziness, and sluggishness. One can’t be a Christian sluggard. A Christian can’t afford to be droopy, duff, or negligent, but diligent in obedience and worship. It is about honoring God as God. • Pray to God for power and grace. • Praise and glorify God Almighty. • Hence, if you are battle weary: Pray and praise. Cast your burden upon the LORD, and he shall sustain you: he shall never suffer the righteous to be moved (Psalm 55:22).